Medisoft Clinical is McKesson’s fully integrated EHR system that works seamlessly with Medisoft practice management tools. This integration greatly increases your efficiency by cutting down the number of times you need to complete tasks in the software. We understand that in a busy medical practice time is of the essence, and maximizing your use of that time is of the utmost importance. Medisoft Clinical makes your day even easier by featuring Bright Note Technology, which allows you to complete a patient chart through one note. This technology takes the searchable data within the note and automatically populates appropriate fields in the patient chart so that your work is minimized. You can choose from a variety of data entry methods so that you are most comfortable with using the program. Medisoft Clinical also features a database of customizable reports, which is only one of the features that makes Clinical ARRA compatible. 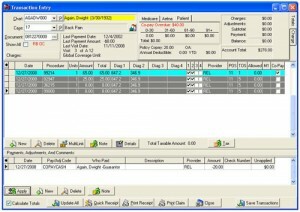 Automatic chart creation: when a patient chart is created in Medisoft or Office hours, the chart is automatically created in Medisoft Clinical. Outside documents pertaining to a patient may be filed in their electronic charts and sent to the Dr. for review. View your patient’s current medication and medication history at any pharmacy in the United States. Incoming results automatically update the patient chart. Keep track of your patients and efficiency of service from the minute they walk in the door – who is checked in, which room they are in and how long, and whether a progress note has been completed. Procedure and diagnoses codes are sent to an unprocessed transactions holding bank straight from progress notes. Billers can post them to transaction entry with one click after reviewing them from the holding screen. The American Recovery and Reinvestment Act signed into law by President Obama in 2009 made allowances for more than $19 billion to be invested into the meaningful use of electronic health records in physician based offices and hospitals. Medisoft Clinical was certified as a complete EHR system by the Office of the National Coordinator Authorized Testing and Certification Body as well as the Certification Commission for Health Information Technology in December of 2010, meaning that Medisoft Clinical is a viable EHR system with which to qualify for the Medicare and Medicaid incentives. The maximum Medicare incentive can reach $44,000 and the maximum Medicaid incentive can reach $63,750. Click here to reach more about these incentives and the Meaningful Use requirements. After 2015, those who have not adopted this technology will receive reduced Medicare payments, in which the percentage of the decrease in reimbursement will increase with each progressive year that it is not adopted by a physician’s office or hospital. Implementing an EHR system into your practice now will not only improve your patient experience, your ease and efficiency of operations, and your patient records management, but also allow you to qualify for a return on your investment and minimal to no penalties. Click here to find out if your practice is eligible. Contact MD Solutions today to find out how we can see you through the EHR implementation process from start to finish. We will work with your office to provide the right, fully customized solution for you and guide you through implementation, training, and continued support. We will also work with you to help ensure that you receive the best incentive possible.